Os grid reference: ST 5052 8867. Located in a field and on the brow of a hill overlooking the Severn Estuary, south Monmouthshire, stands the more than 4,000 year old prehistoric barrow or cairn called Heston Brake Long Barrow, sometimes also referred to as a “chambered tomb”or “dolmen”. The barrow still has nine of its stones positioned (maybe in situ) on top, but has obviously suffered over time from damage caused by vandals digging into it, although in the late 19th century it was excavated by archaeologists. It is located in a field at Black Rock – about half a mile to the north-east of Portskewett, and just 100 metres to the west of Leechpool Lane. This ‘now’ partly destroyed barrow stands (on private land) about 150 metres south of a footpath heading in a westerly direction from Lower Leechpool Farm on Leechpool Lane. The village of Mathern is some 2 miles to the north-east. The remains of the barrow’s two inner chambers (internally connected E and W sides) apparently measured 26 feet long by 5 feet across, according to Fred Hando (in the much acclaimed work ‘Hando’s Gwent’); however the middle section of the monument was destroyed in more recent times. However the 9 standing and recumbent pudding-stones on the 1 metre high mound still look very impressive. It would seem that there were originally 13 upright stones here but 4 of these have now gone – probably being robbed-away to the local area for walls. At the east side (the probable entrance to the chamber) an impressive-shaped stone is 5 foot in height and shaped like a knife or axe-head, while beside it a 2 foot high square-shaped stone (called the chopping block) by local author Fred Hando in the work ‘Hando’s Gwent’, where there is a drawing of ‘Heston Brake Tumulus by moonlight’ on page 159. So could this ancient monument have been used for sacrificial/ceremonial purposes back in the Neolithic Age? 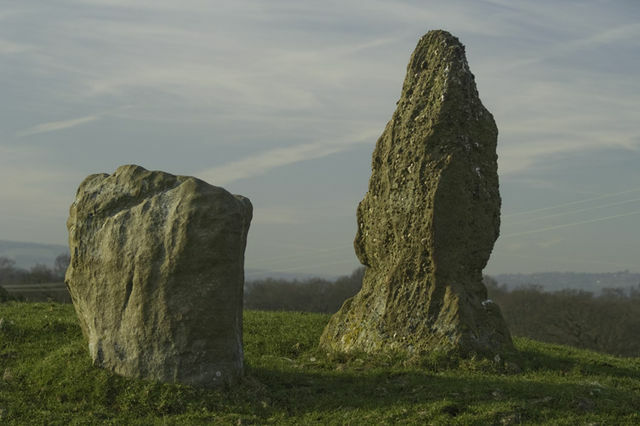 All the other stones here are somewhere between 1-2 feet in height; but obviously the low mound on which they now stand would originally have been much higher and would have covered the standing stones by several feet. The mound contained two interconnecting chambers for burials – which revealed various antiquities when it was excavated back in 1888, although at this time it became known that, very unfortunately, earlier vandalism and, or robberies had taken place here, according to Chris Barber and John Godfrey Williams in their excellent book ‘The Ancient Stones of Wales’ (1989). The authors also say that: “It is marked as Long Barrow on the Ordnance Survey maps of 1953 and 1981”. In the work ‘Wales: An Archaeological Guide’ (1978) by Christopher Holder we are told that: “The present condition of the stone structure and the mound of this chambered long barrow is misleading. Excavations in 1888 showed it to consist of a gallery 8 m long by 1.5 m wide, in the E. end of a barrow 18 m long by 9 m wide”. And it would seem, according to Christopher Holder, that in spite of its position by the Severn, virtually in sight of the Cotswolds, “it seems to belong with Gaerllwyd….. to a tradition of more western origin, distinct from that of the Black Mountains and….. Parc Cwm”. At the excavations of 1888 a number of human bones were dug up from the earliest period and, some pottery sherds from slightly more recent times. The late author Fred Hando in the work ‘Hando’s Gwent’ adds that: “if you would like to feel cold shivers down your spine, choose a moonlit midnight next summer and visit this long barrow alone”. Okay, thanks Fred, will do that next time! The late and renowned author Roy Palmer in his epic tome ‘The Folklore of (Old) Monmouthshire’ speculates as to Heston Brake, among a couple of other sites nearby, being the place where the British (Celtic) chieftain Caractacus or Caradoc lived for a time with the ancient Silures tribe in the early part of the 1st century AD, but eventually he went to Rome and died there after being pardoned by the emperor Claudius – sometime after 51 AD. Hando, Fred., Hando’s Gwent, (Ed. by Chris Barber), Blorenge Books, Abergavenny, Gwent, 1987. Holder, Christopher., Wales: An Archaeological Guide, Faber & Faber, London, 1978. 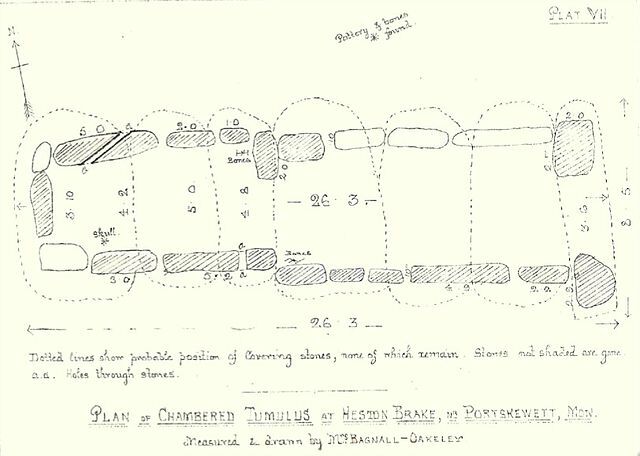 Plan of Heston Brake chambered tumulus, Monmouthshire, by Mary Ellen Bagnall Oakeley, 1888, can be found in Volume 2 ‘Proceedings of The Clifton Antiquarian Club’. Categories: Burial Mound, Cairn / Cairn Circle, Dolmen | Tags: Heston Brake Long Barrow at Portskewett in Monmouthshire | Permalink.